Angel Oak is located on John's Island and has been owned by the city of Charleston, South Carolina since 1991. It is considered to be among the oldest living things in the United States. Estimates of it's age range anywhere from 400-1400 years! She stands some 67 ft. tall, has over a 28 ft. circumference and is 187 ft. in length from tip to tip of the longest branches. 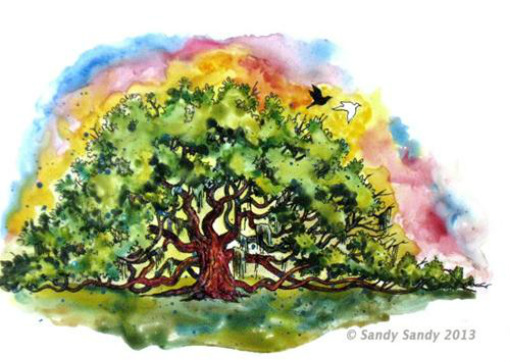 Angel Oak is threatened by development by the city of Charleston. Now it makes sense that the painting evolved with a yin-yang pair of doves flying from the tree. (Not my original intention.) Hey, do you believe in divine intervention?